Burlington is Vermont’s largest city, but it feels more like a quirky college town. With a youthful, eco-conscious, independent vibe and an enviable location next to New England’s largest lake—and not far from Vermont’s premier ski mountains—Burlington makes a perfect launchpad for an adventurous getaway. 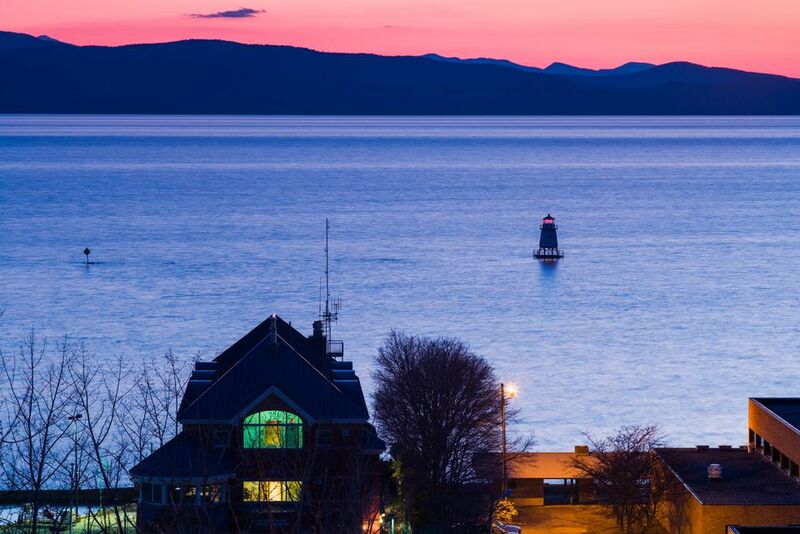 Whether you’re staying at the city’s hip Hotel Vermont, attending school at the University of Vermont, Champlain College or Burlington College, or simply visiting for a day, some fantastic activities and sights are distinctly Burlington which shouldn't be missed. The views of New York’s Adirondack Mountains to the west and Vermont’s Green Mountains to the east are reason alone to get out on Lake Champlain. There’s also this business about a Loch Ness-like lake monster, so take a shot at spotting Champ and trying to photograph the mysterious beast. Consider booking a cruise aboard the Spirit of Ethan Allen, which offers a regular schedule of scenic, dining and themed excursions mid-May through mid-October. The Lake Champlain Ferries has trips from Burlington to Port Kent, New York, which are a leisurely way to experience the lake’s natural beauty. Burlington’s lively, central, open-air shopping thoroughfare is home to more than 150 shops, kiosks, and restaurants. More than 70 percent of them are locally owned, so you won’t find typical mall offerings. This is your place to shop for Vermont Flannel Company plaid shirts, Simon Pearce Vermont-blown glassware, Danforth Pewter handcrafted locally, and other uniquely local finds. Be sure to stop for a delicious scoop of Ben & Jerry’s ice cream—Burlington’s most famous home-grown global success story. When the weather’s warm, live music and street entertainers make the retail hub feel like a party. In the heart of the city, you’ll find eight miles of paved bike path known as the Burlington Greenway, connecting parks along Lake Champlain’s shore. Bring your bike or rent one from waterfront outfitter Local Motion. Burlington also has a bike share program, which only costs a few dollars to borrow for 30 minutes. If you’re serious about exploring on two wheels, you’ll be happy to learn that Burlington sits in the midst of an unbelievable 1,600-mile network of bike paths in Vermont, New York, and Canada. The Lake Champlain Bikeways include 35 mapped routes from 10 to 60 miles in length. Did you know Vermont has more breweries per capita than any other state in the nation? While you’re in Burlington, there are copious opportunities to sample fresh, innovative craft beers in Burlington-based breweries with tasting rooms like Zero Gravity Craft Brewery, Foam Brewers and Switchback Brewing Co. In South Burlington, Magic Hat offers free guided or self-guided tours of its 175,00-barrel production facility, plus food and 15 beers on tap at the Artifactory. For a taste of one of the most popular locally brewed drafts, try the Heady Topper—brewed about 30 minutes away by The Alchemist—at trendy restaurants like Hen of the Wood and Farmhouse Tap & Grill. The hoppy double IPA has been rated the best beer in the world. Observing molten glass twirled, blown and molded, is quite the spectacle. Stop by the AO Glass factory in Burlington’s arts district Monday through Friday for a glimpse of modern artisans perfecting the age-old craft. The design and manufacturing facility creates everything from delicate Christmas ornaments to commercial lighting glass. Visitors are welcome to stand outside the garage door and observe while soaking up the warmth that emanates from the 2,100 Fahrenheit furnace. It's a perfect, no-cost activity for a chilly day. At ECHO, Leahy Center for Lake Champlain, visitors find a multifaceted science center and freshwater aquarium focused on educating the world about the ecology of Lake Champlain. Home to more than 70 live animal species, a 3-D movie theater, and interactive exhibits, the waterside attraction is a fun place for kids and adults to observe and learn about everything from invasive species to data visualization—a topic made visually stunning thanks to the 7,500-LED Lake Brite installation. Burlington is Vermont’s destination for unique festivals. A few annual events to keep on the calendar include winter’s Magic Hat Mardi Gras, where floats glide through the snow, and First Night Burlington, the city’s alcohol-free, arts-filled New Year’s Eve celebration. During the warmer months, the festival schedule includes, the Discover Jazz Festival held for ten days each June at venues citywide, the Vermont Brewers Festival set on the shores of Lake Champlain in July, and August’s annual Festival of Fools, featuring comedy, busking and music focused on eliciting laughter. In mid-September, the Grand Point North outdoor music festival finds large crowds grooving out by the Waterfront Park on Lake Champlain. Sure, you'll find Dunkin’ Donuts and Starbucks in Burlington, but in a city that eschews chain establishments of any sort, perfect days start with caffeinated beverages at funky, independent tea and coffee houses like Dobra Tea, Radio Bean or Uncommon Grounds. Some of the city’s coffee hangouts also morph into night spots late in the day with live music and adult beverages. All offer a glimpse of life in this northern city where offbeat is the norm. Shop at BRIO Coffeeworks to bring Vermont-roasted coffee home to friends. Willy Wonky has nothing on the Lake Champlain Chocolates factory tour. Take a seat in front of the observation windows, and savor the sweet scent while observing how truffles, caramels, and molded chocolates get created. The through-the-window tours—and delicious samples—are free Monday through Friday. Self-guided tours, available when regular tours are not in operation, are the best choice if you are visiting Lake Champlain Chocolates with small kids. And don’t worry—these self-guided tours include a sample, too. On weekends, you can learn how to appreciate chocolate’s flavor variations during a complimentary guided tasting session. Don't miss the gift shop for factory-fresh, all-natural favorites like maple caramel dark chocolate bars, almond butter crunch, and organic hot chocolate, plus fun assortments. This live music hot spot in South Burlington is actually two intimate music clubs in one, and that means you’ll find a busy calendar of concerts worth seeing while you’re in Burlington. From the local talent and tribute bands to headliners like Elvis Costello & The Imposters, Grace Potter and Gavin DeGraw, the venue books memorable shows for its two stages and other nearby arenas. Most shows are all ages. For more live music events in this city with a thriving cultural scene, check Seven Days' music calendar.